Find out more about our sailing programs. Learn how you can get involved with YSV and help make a difference. Youth Sailing Virginia is an all-volunteer 501(c)(3) non-profit organization dedicated to making sailing available and affordable to the youth of the greater Hampton Roads area. Sailing gets kids unplugged and active outdoors. While out sailing, they are not only having fun, but also learning skills that will serve them well throughout their life. Independence, concentration, self-reliance, decision making, teamwork and leadership are just a few of the life skills that develop in youth sailing. In 2018 we expanded opportunities, which will continue into 2019 as we open new opportunities for our area youth to experience the many benefits of sailing. None of this would be possible without the generous support of individuals, local businesses, foundations and the tireless work of dedicated volunteers. Please help us make sailing available for all our area youth by donating to Youth Sailing Virginia! Youth Sailing Virginia, Inc. is a 501(c)3 non-profit organization; we currently offer a practice and regatta venue for area high school sailing teams from our location at historic Fort Monroe in Hampton, VA. With the support of the City of Hampton, a pier was built on Mill Creek for community access, with Youth Sailing Virginia at the heart of the boating center. Our plan is to expand by offering learn-to-sail programs in conjunction with the Peninsula YMCA and Hampton Parks and Recreation. 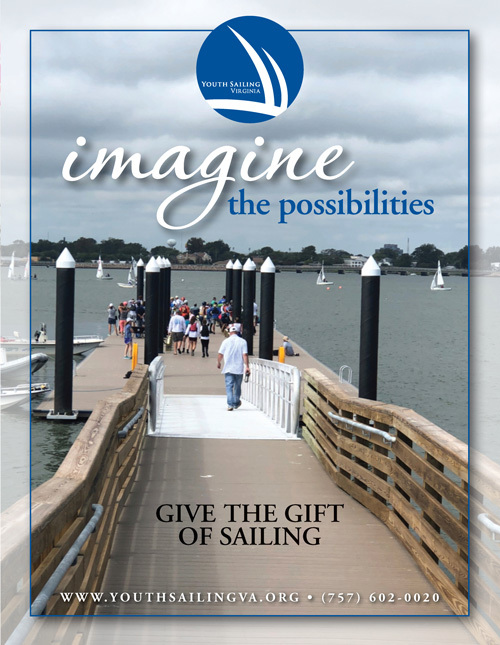 During the fall of 2013 Board Member, Gary Bodie presented his dream of a new youth sailing facility at Fort Monroe to a group that included coaches, parents, and other members of the local sailing community. Following this meeting at the Hampton Yacht Club the discussions continued and the dream became a reality with the support of sailors and community business leaders alike. Board Member, Kevin Eley was recruited to head up the organization that became known as Youth Sailing Virginia, Inc. (YSV). With the support of Glen Oder, Executive Director of the Fort Monroe Authority, YSV moved forward to create a practice site. With repaired floating docks anchored in Mill Creek, and seven old FJs, Coach Allen Kilgore’s Kecoughtan and Phoebus High Schools teams began sailing in Mill Creek in March of 2014. In May of 2014 the opportunity to purchase 18 gently used Flying Juniors from Dartmouth College provided YSV with the matched fleet necessary to host regattas. In August, volunteers began rebuilding a larger float dock donated to YSV. With the 18 boats on the water YSV could now practice for Hampton, Kecoughtan and Phoebus High Schools and Hampton Roads Academy. 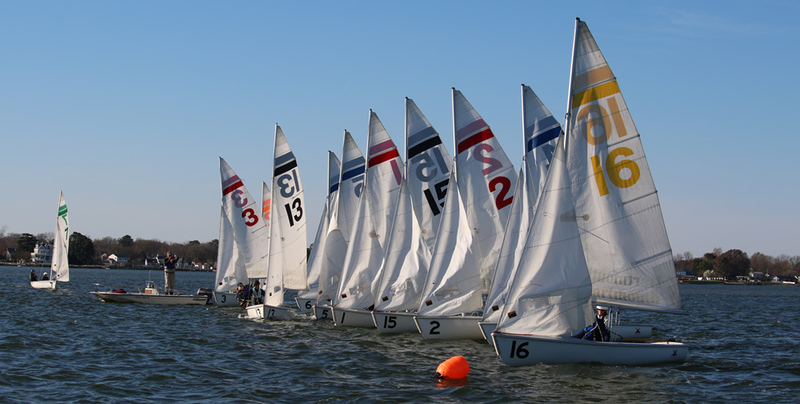 In October YSV hosted its first scrimmage regatta for the 14 teams of the Virginia Interscholastic Sailing Association (VISA). Let us introduce our boats that allow sailors to enjoy Mill Creek on historic Fort Monroe. YSV continues looking forward and is committed to improving and upgrading our fleet of 18 Club Flying Juniors. Today the FJ is the predominate class of boat sailed by high school and college sailing teams in the United States. High school sailing is a coed sport. The boats are sailed by a crew of two and spinnakers are not used. Youth Sailing Virginia’s mission is to develop a vibrant Youth Sailing Program that serves the greater Hampton Roads area and involves a broad spectrum of the community in both support and participation. YSV sailing venue is strategically located on the shallow waters of Mill Creek at historic Fort Monroe.